The Ipswich Rotary Club has unanimously elected Cushing Titcomb as Vice President. Titcomb will become President Elect on July 1, 2016, and will be club President in 2017-18. In his capacity as Vice President, Cushing will oversee the club’s community service initiatives in both Ipswich and Rowley. He will head a planning team that works with both towns to identify service projects to make these towns a bit better. The planning committee also is responsible for ensuring that implementation teams are assigned to each project. As President Elect the following year, he will assume responsibility for general oversight and coordination of the club’s fundraising initiatives. A long time Ipswich resident, Cushing is a well-known local business and community leader. He joined Ipswich Investment Management in 2004 and became owner/partner in January, 2007. His extensive career began at State Street Bank in 1974. In addition to Rotary, Cushing currently serves as Treasurer of both the Ipswich Museum and the Ipswich Community Access Media Committee. An avid bike rider, he has participated in the “Ride to Defeat ALS” and in the “Pan Mass Challenge” two day event for the Dana-Farber Cancer Institute. Cushing also actively supports the Mass Chapter of the Alzheimer’s Association. Ipswich Rotary welcomes Cushing to our strong leadership team. 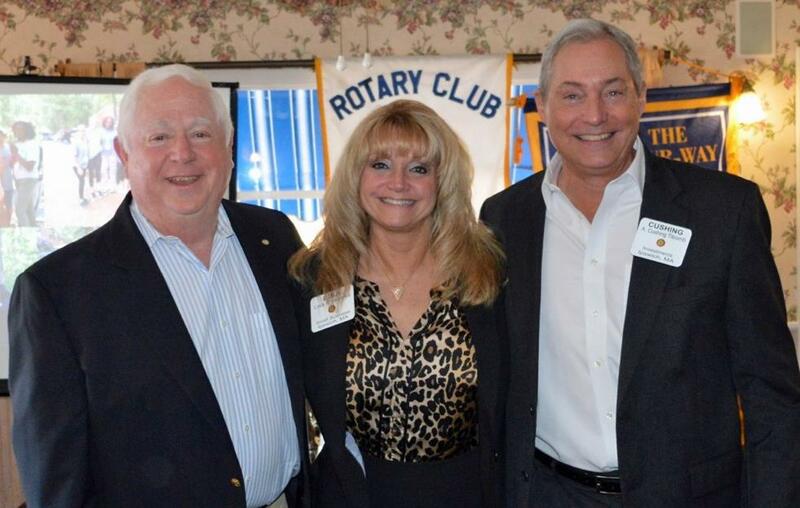 Seen in the photo are President Bob Gravino, President Elect Lisa Shanko, and Vice President Cushing Titcomb.